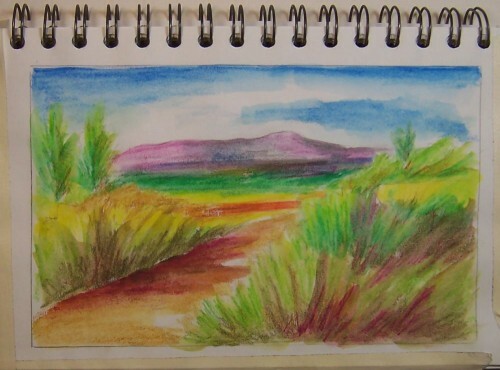 This entry was posted on Sunday, June 24th, 2012 at 3:26 pm	and is filed under Color, Landscape, Paintings, Watercolor. You can follow any responses to this entry through the RSS 2.0 feed. You can leave a response, or trackback from your own site. This looks great! But last week’s flower sketch just keeps on popping into my mind. That one was extraordinary, color and composition wise!! Thanks, Susy! Sometimes when I just let things go, they come out better than a lot of planning! As usual, keep those doodles coming! I’m with Susy, the flower one is the one I prefer. This one is very nice also, but the pen and ink is my love. Thanks for the comment, Leila. I was just playing around with the watercolor pencils and not specifically trying to do my best. I wanted to see how the colors would act with different thicknesses of pencil. No doubt the pen and ink one is better because it’s what I like to do most besides pastels. What I enjoy is how you sweep from monochrome or muted palettes to saturated color pieces like this… it’s a diverse range. Thanks, Thom. It’s my strong need not to be bored, I think, that keeps me jumping around.